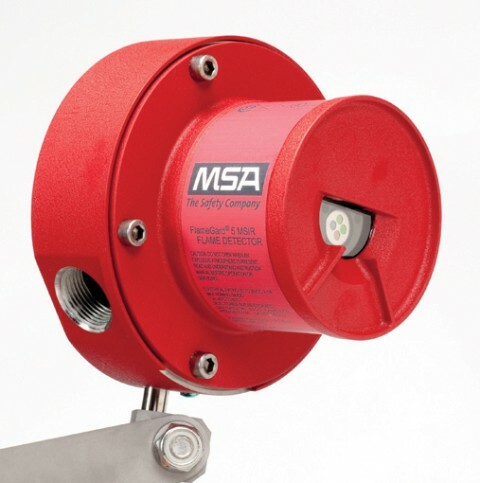 MSA's FlameGard 5 MSIR Detector is an advanced multi-spectrum flame detector designed to provide superior false alarm immunity with the widest field of view. The FlameGard 5 MSIR Detector employs a state-of-the-art multi-spec - trum infrared (MSIR) sensor array with a sophisticated Neural Network Technology (NNT) system. Designed to detect typical fires such as those produced by alcohol, n-heptane, gasoline, jet fuels and hydrocarbons, the FlameGard 5 Detector can see through dense smoke produced by diesel, rubber, plastics, lube oil, and crude oil fires. The NNT flame discrimination algorithm classifies the output signals from the MSIR sensor array as either fire or non-fire. This MSIR/NNT combination is highly immune to false alarms caused by lightning, arc-welding, hot objects, and other sources of radiation. The serial communication port(s) allows 128 units (247 using repeaters) to be linked up to a host computer using the Modbus RTU protocol. The communication registers provide alarm status, fault and other information for operating, troubleshooting or programming the unit. The continuous optical path monitoring (COPM) self test checks both the optical path integrity (window cleanliness) and the detector's electronic circuitry every two minutes.